If you live in the UK and never cycle in the rain, you likely never cycle! For those fair-weather cyclists among us, in the UK and around the world, our expert guide and cycling journalist Hannah Reynolds has 5 tips on making riding in the rain less daunting and more fun. 1. No such thing as bad weather! No such thing as bad weather, there is only bad clothing! If you have only ever cycled in one of those horrid plastic macs that leave you hot and sweaty, like some sort of ‘boil in the bag’ fish, then riding in the rain is awful! Decent technical weather cycling kit has come on in leaps and bounds, yes it can be pricey. However, if it increases the number of hours you are happily able to ride your bike, it is well worth it. The first item on your shopping list should be a breathable jacket that will keep you warm even when it gets wet. Gloves and overshoes are the next purchases, preferably in neoprene, which stays warm when wet, or Gore-Tex, which is breathable and waterproof. Accessories like clear or amber-tinted glasses will help keep the rain out of your eyes while giving you good visibility, and a peaked cap under your helmet can direct rain away from your face. Getting wet isn’t the problem, getting cold is. Yes, feeling a bit damp and squelchy can be annoying but getting cold and shivery is a real problem. Dress according to how fast you intend to ride. 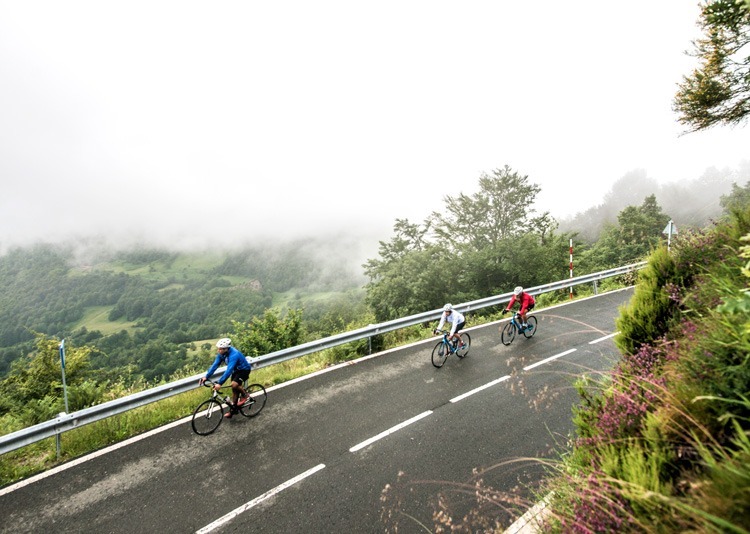 Riding hard will generate more body heat so a plasticky waterproof jacket could leave you very sweaty, whereas the new breed of wet weather jersey is lightweight and breathable. For fast wet rides wind proofing is more important than water proofing as the water evaporating off your body will cool you down fast. 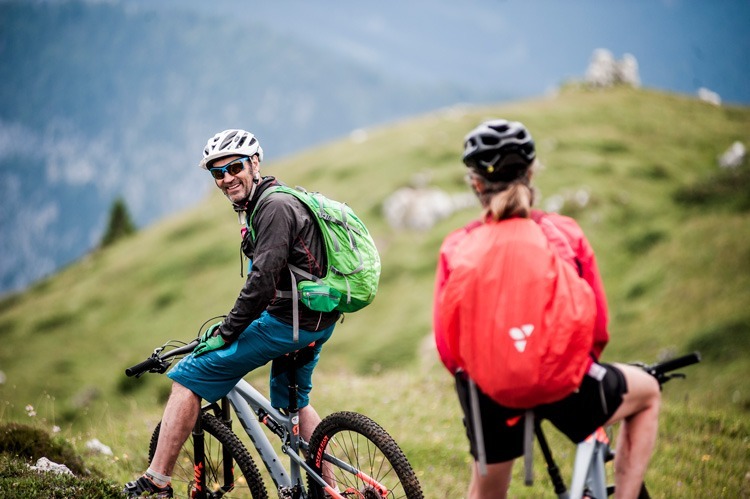 On slower wet weather rides you can afford to layer up and wear more heavy duty, waterproof materials such as Gore-Tex as here you are looking to keep a little drier as well as warm. Mud-guards are amazing bits of kit that are still sadly underestimated. A decent set of guards will keep spray out of your eyes and keep your bum dry. Avoiding the long streak of watery mud up your backside will help prevent your shorts filling with an uncomfortable grinding paste of dirt or road debris. Adjusting your tyre pressures can also help with wet weather riding. Just letting them down slightly will help increase the surface area and traction on damp surfaces. Before a wet ride check your brake pads are plentiful as extra braking and grit on a wet day can wear them down quicker than you would normally expect. Riding in the wet requires you to slightly adjust your riding style. You don’t need to be overly cautious as you should still have plenty of grip, but you do need to think ahead and moderate your speed. Braking will usually take longer in the wet, so allow a little bit more time and distance than usual. Be aware that with wet rims or discs, sometimes the first squeeze of the lever(s) only dries off the braking surface before pads can really “bite”. Wet surfaces offer less traction, so don’t grab big handfuls of brake which make it more likely for your wheels to lock up and skid. Instead concentrate on gently squeezing and releasing your brakes when you are in a straight line, not cornering. Riding in the wet requires you to have some knowledge of how your bike will behave on different surfaces. You can expect that some things you ride over in dry weather are now best avoided. Painted road markings are notorious for causing accidents (even in the Tour de France), and are best avoided. Similarly, drain covers can present a serious hazard in the wet as can tram tracks, cattle grids, and other metal surfaces. If you do need to cross tracks or cattle grids, do so in a straight line at right angles. 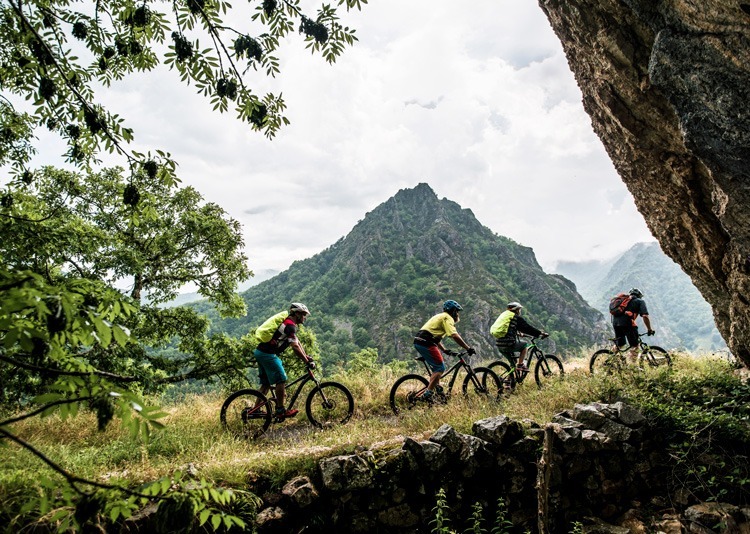 There are even more exciting surfaces to explore off-road; wet chalk – rides like ice; green moss – very slippy, slate – occasionally grippy, sometimes slidey (that a word? ); clay – clogs your wheels. 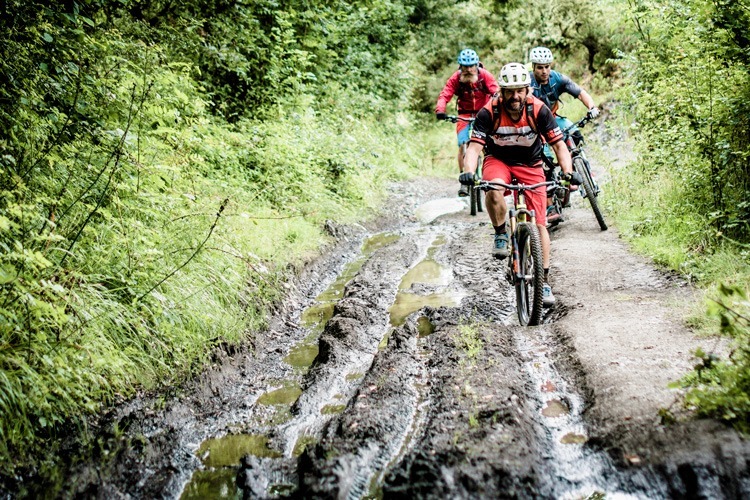 Learning how different surfaces behave in the wet is part of the skill and fun of mountain biking. A trail you know well from dry, sunny days can feel like something completely different in the rain, just another reason to not let wet weather keep you indoors.